It’s a continued pleasure to have so many returning clients and customers, here’s a few shots of the lovely Evie’s healed rook and nose piercings; with an additional fresh top-ear/helix piercing. The ear work has been pierced w/1.2mm titanium whilst the nose has a sapphire blue gemstone head. This entry was posted in Nose Piercings, Piercing Portfolio, Rook Piercings, Top Ear / Rim Cartilage Piercings and tagged Body Mods, Body Piercer, Body Piercing, Ear Cartilage, El Capitan, Greenwich, Helix Piercings, London, London Piercer, London Piercing, Nose Piercings, Piercing Portfolio, Rook Piercings, SE10, Shiva Piercings, South East London, Titanium, Top Ear / Rim Cartilage Piercings, UK Body Piercing, UK Piercer, UK Piercing, Various Ear Work. Bookmark the permalink. 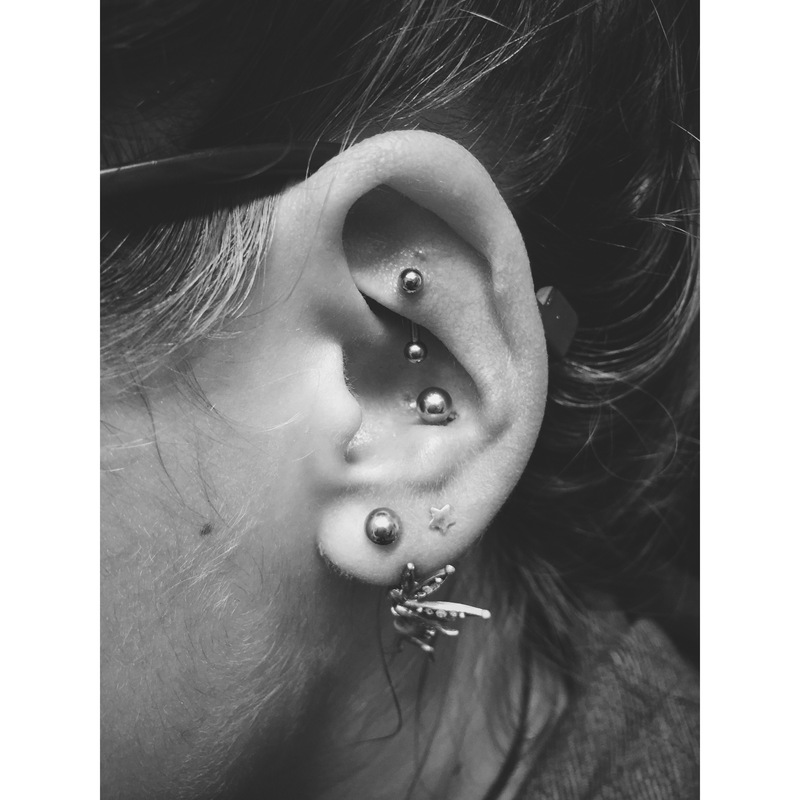 Claire was after something different jewellery wise and chose to have a star fitted around three months after I originally pierced her rook. 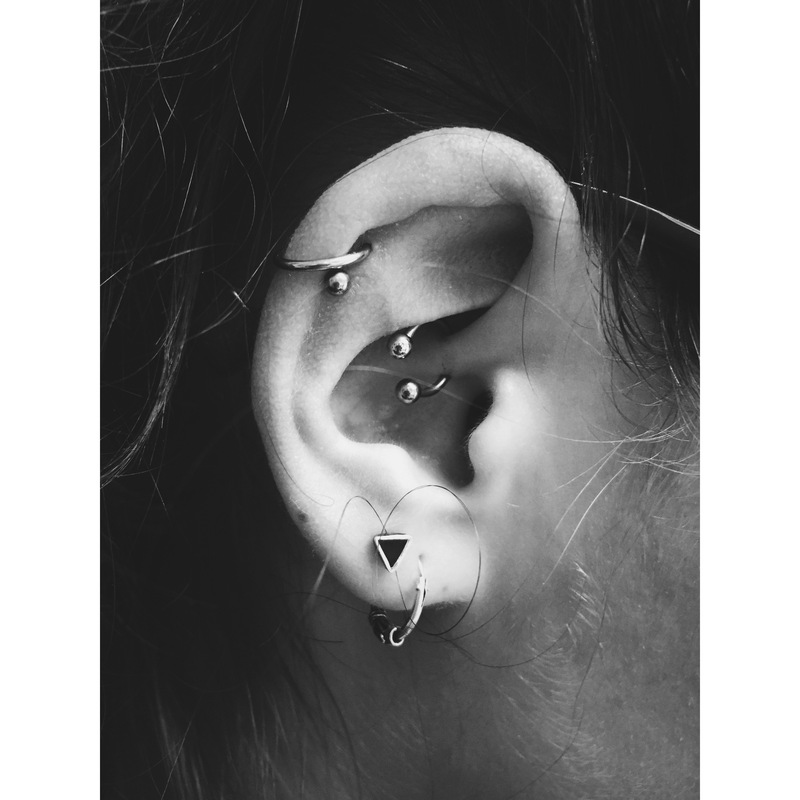 A rook can take at least three-six months, sometimes longer to heal; so I always advise cleaning a piercing for a couple of weeks after first/initially changing the jewellery it was pierced with. 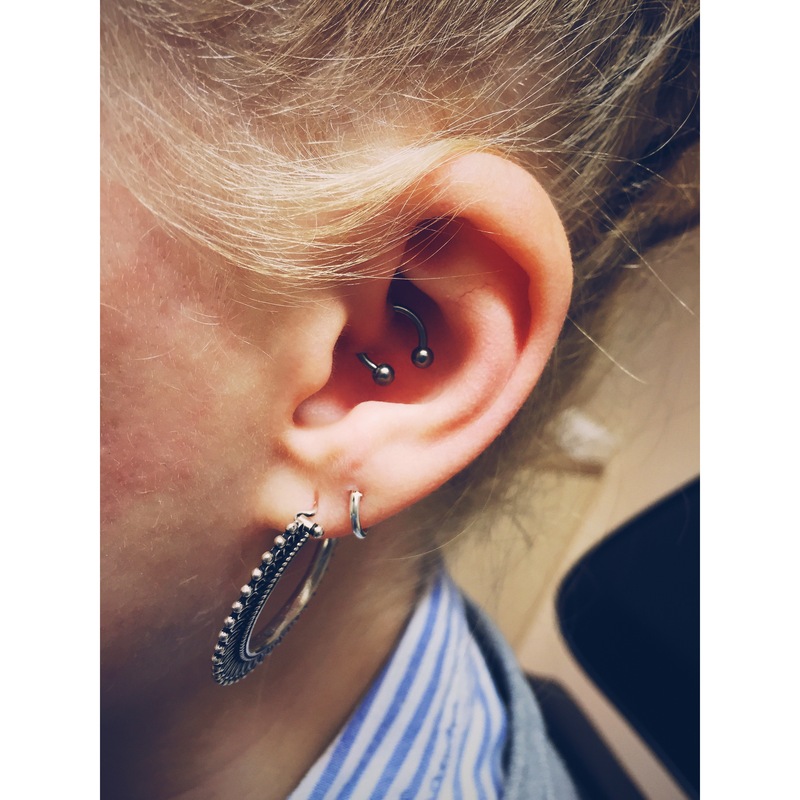 This entry was posted in Piercing Portfolio, Rook Piercings, Uncategorized and tagged Body Mods, Body Piercer, Body Piercing, El Capitan, Greenwich, London, Piercing Portfolio, Rook Piercings, SE10, Shiva Piercings, Steel Star, Steel Star Jewellery, Steely Stars. Bookmark the permalink. 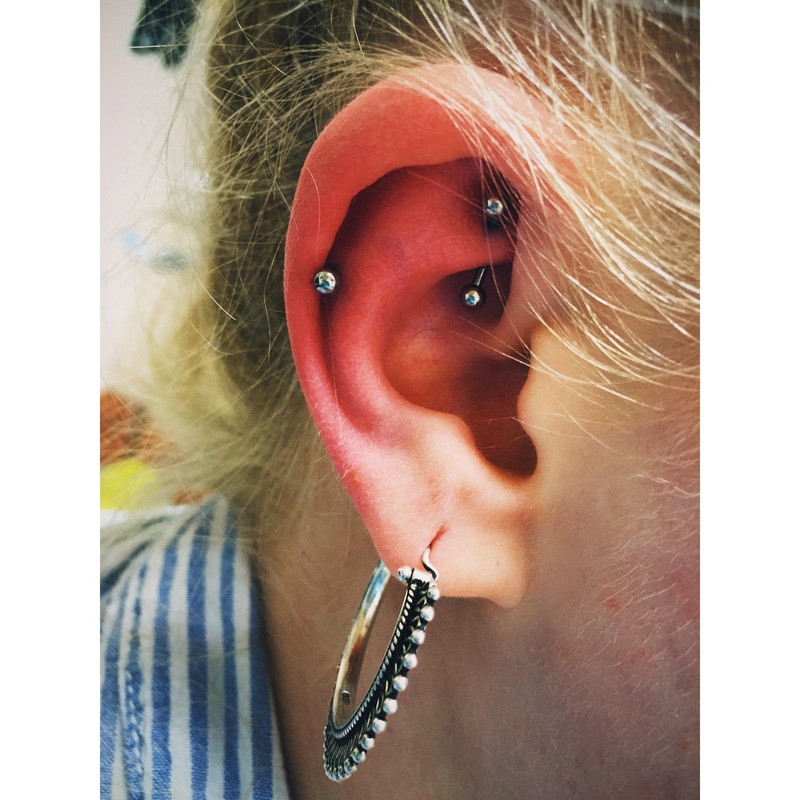 Hollie’s healing rook pierced w/1.2mm x 8mm curved bar, alongside a fresh scaffold/industrial piercing w/1.6mm titanium. Always a pleasure to see returning custom/clients who have looked after their piercings. 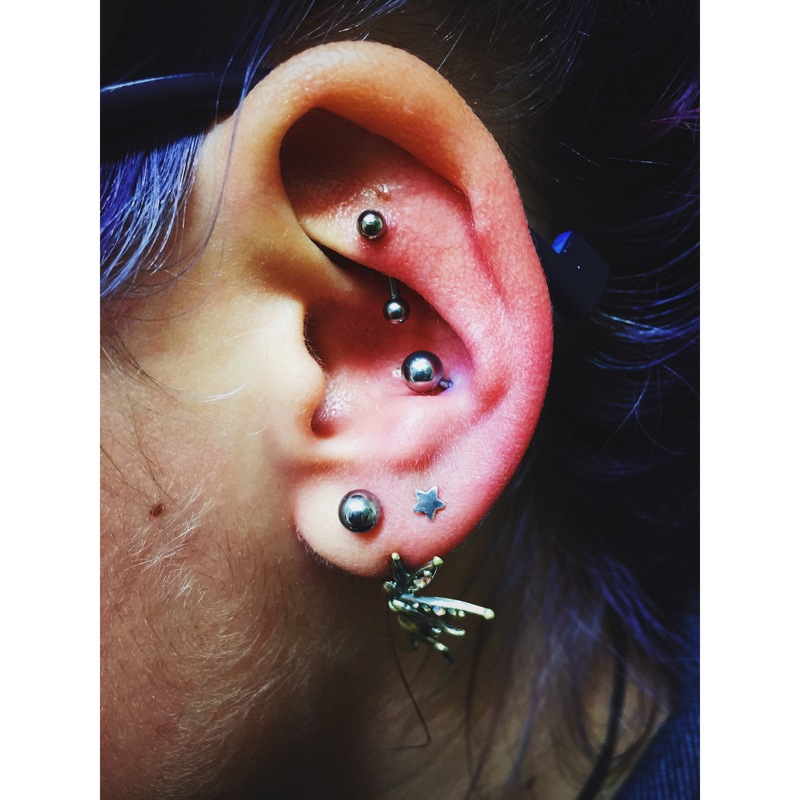 This entry was posted in Piercing Portfolio, Rook Piercings, Scaffold Piercings and tagged Body Mods, Body Piercer, Body Piercing, El Capitan, Greenwich, Industrial Piercings, London, London Piercer, Piercing Portfolio, Rook Piercings, Scaffold Piercings, SE10, Shiva Piercings, Titanium, UK Piercer. Bookmark the permalink. 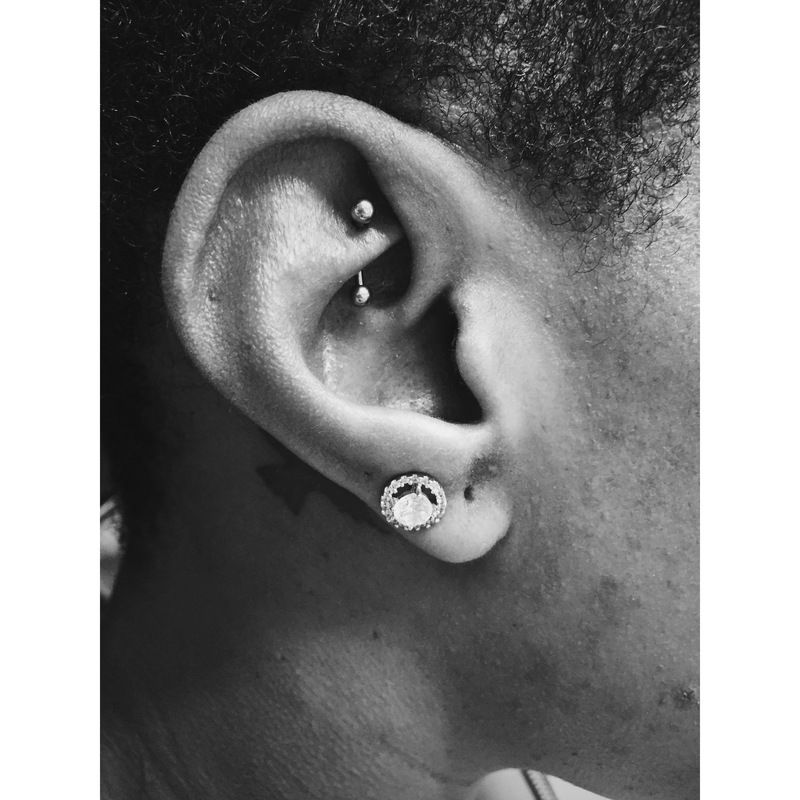 Rochelle’s rook pierced w/1.2mm x 8mm curved titanium bar by El Capitan @ Shiva Piercings. 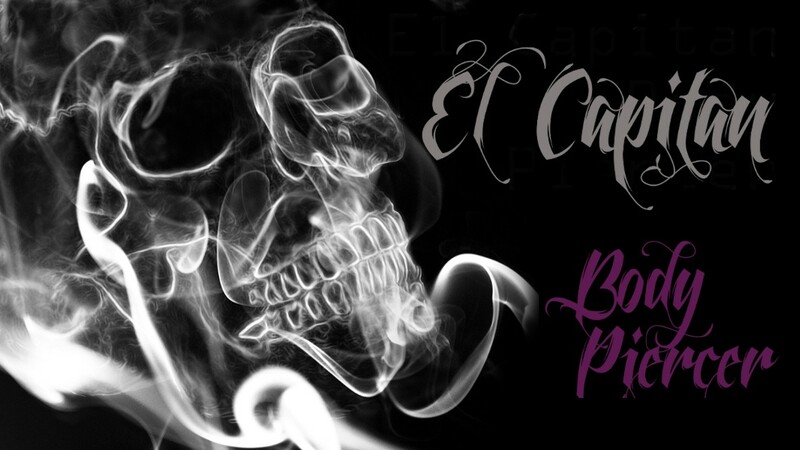 This entry was posted in Piercing Portfolio, Rook Piercings and tagged Body Mods, Body Piercer, Body Piercing, El Capitan, Greenwich, London, Piercing Portfolio, Rook Piercings, SE10, Shiva Piercings. Bookmark the permalink. Jade’s daith piercing is healing well after a few months w/1.2mm x 8mm titanium CBB. 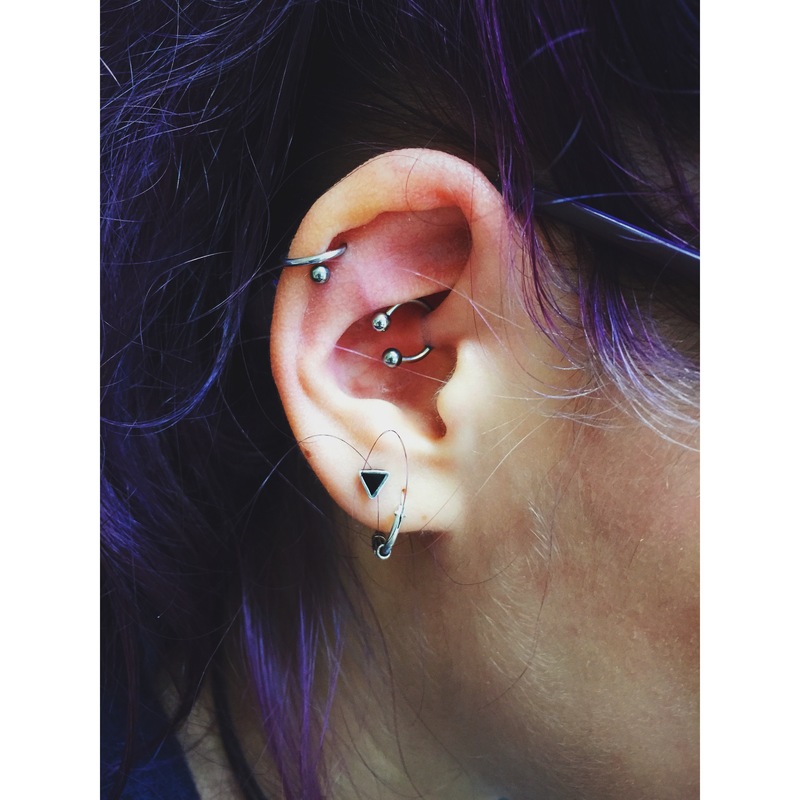 Two new additions with the rook piercing w/1.2mm x 8mm curved titanium bar and a top-ear, helix piercing w/1.2mm x 10mm titanium bar. Always a pleasure seeing returning clients and custom for a continual metal collection. This entry was posted in Diath Piercings, Piercing Portfolio, Rook Piercings, Top Ear / Rim Cartilage Piercings and tagged Body Mods, Body Piercer, Body Piercing, Continual Metal Collection, Daith Piercings, Diath Piercings, El Capitan, Greenwich, Helix Piercings, London, Piercing, Piercing Portfolio, Piercings, Rook Piercings, SE10, Shiva Piercings, Titanium, Top Ear / Rim Cartilage Piercings, Various Ear Work. Bookmark the permalink. All of the lovely Alicja’s ear piercings pierced by El Capitan @ Shiva Piercings. 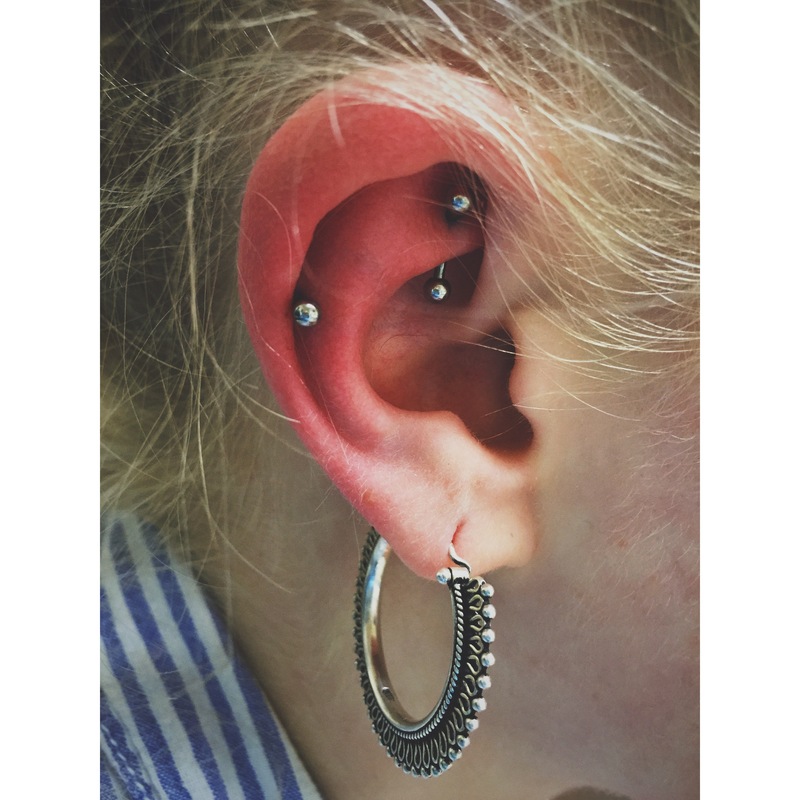 At the time of taking these photos we had just added a daith w/CBB and a conch w/labret bar. All pierced w/1.2mm titanium and again a real pleasure to meet so many wonderful people doing what I do. 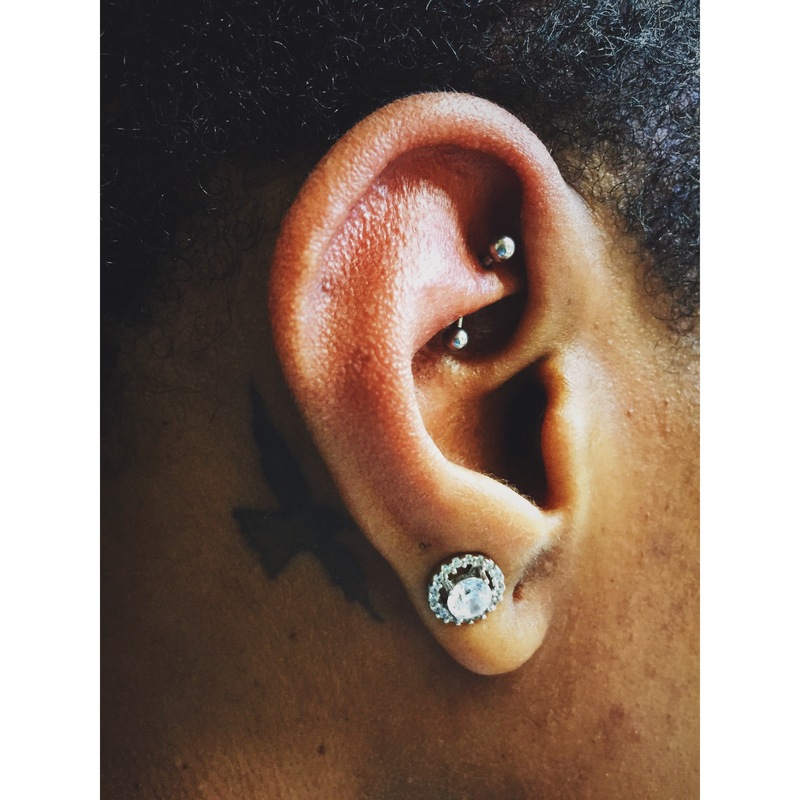 This entry was posted in Conch Piercing, Diath Piercings, Lobe Piercings, Piercing Portfolio, Rook Piercings, Top Ear / Rim Cartilage Piercings and tagged 1.2mm, Body Mods, Body Piercer, Conch Piercings, Daith Piercings, Diath Piercings, Double Piercings, Ear Cartilage, Ear Piercing, El Capitan, Greenwich, Lobe Piercings, London, Piercing Portfolio, Piercings, Rook Piercings, SE10, Shiva Piercings, Titanium, Top Ear / Rim Cartilage Piercings, Various Ear Work. Bookmark the permalink.